Who’s it for? New users, people who want extended run time on the go. 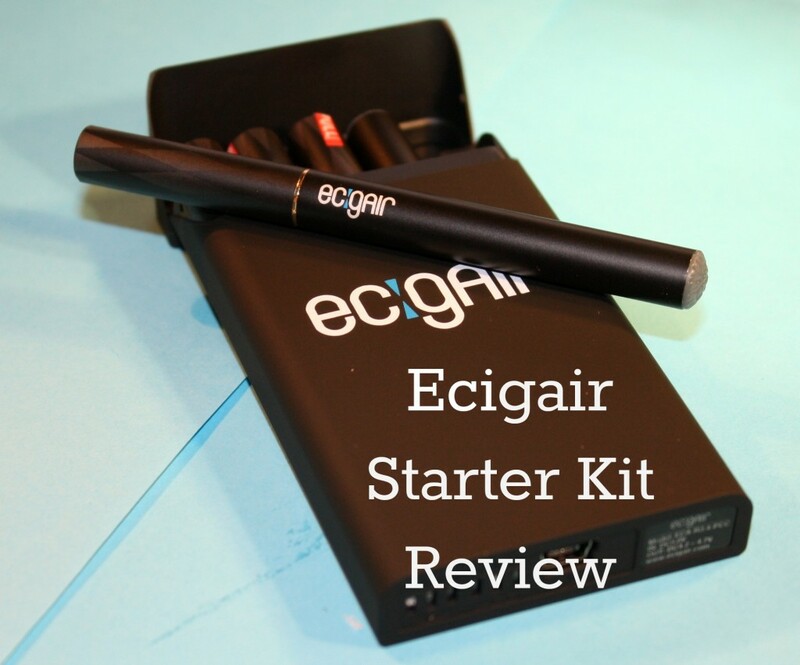 What’s in the Ecigair Starter Kit? This kit comes with two 22o mAh automatic batteries, 5 cartomizers (traditional in 0 or 11mg nicotine) a wall adapter, a USB mini cable and, of course, the slimline charging case. The case is the centerpiece of this kit, so I’ll start there. From the outside, the case looks like a small plastic box a little taller than a cigarette box and about half as thick. The top of the case features a flip top like many popular cigarette packs. Stamped across the front of the case is the company’s logo. The rest of the case is black (like everything else in this kit) and has a sort of rubberized coating. On the bottom of this otherwise plain black box is a series of slots where the LED charging lights shine through. 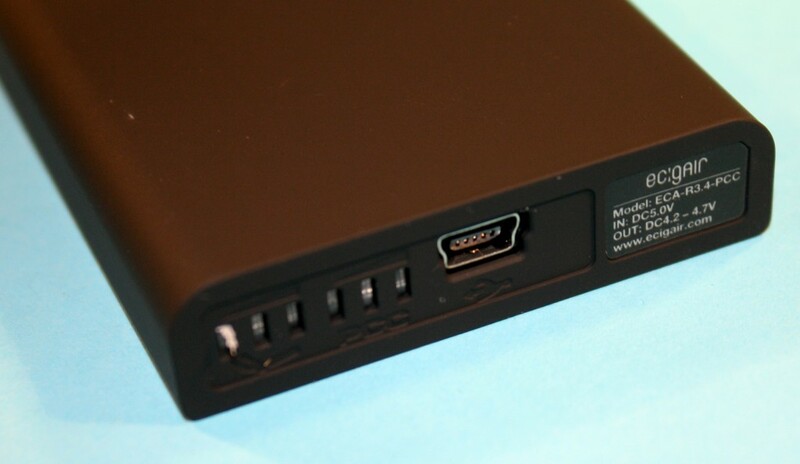 There’s also a mini USB port in the middle of the box bottom for charging. This is the somewhat less used standard mini cable which is not as popular as the micro USB connectors found on most Android phones. Basically the way the case operates is fairly simple. There is an internal battery rated at 11oo mAh of capacity that is charged via the USB connection. That battery, in turn, is used to charge the smaller automatic e-cigarette batteries. Charging is of course done inside the case, through one of the best features of this case other than its size. There are five spots available inside the case. Three are used to hold spare refills and one can hold an e-cigarette battery with a cartomizer already attached. The last spot between the former and latter positions is the charging port. Unlike many charging cases I’ve looked at before, this one uses friction to hold the battery in place. Simply slide the battery in and close the lid to engage charging. Its not necessary to screw the battery into any kind of terminal. This ups the ease-of-use factor quite a bit. The generous storage plus the case’s ability to give you at least four decent recharges makes it a great companion for those nights on the town doing whatever it is people with social lives do. Not that I would know, but I’m not bitter about it or anything. Moving on. The rest of the kit is fairly standard basic e-cigarette fare. It is worth mentioning the batteries and cartomizers use the somewhat obscure RN4081 threading standard. While there’s nothing in particular wrong with the design it’s not as popular, so should you want to find another source for refills, you might have a bit of a hunt on your hands. Fortunately, despite the poor selection (or lack thereof) included with the kits, the company does have a selection of flavors available. They are still limited to either zero nicotine or 11mg with nothing higher octane on tap. This kit is fairly basic, so it’s not like there are any unusual tips and tricks to go along with this kit. When there’s an e-cigarette battery charging in the case, the first three white LEDs on the bottom of the case will blink indicating charge level until they go out after a full charge. Same deal with the case while it’s charging with a set of three more white LEDs next to the e-cigarette battery indicators. It’s quick and easy to read without having to press any buttons to get a status. Using an automatic e-cigarette battery is similarly simple you puff, the blue LED at the end lights up and you get vapor. Although there is a certain technique to it if you want to coax more vapor out. Take a primer puff before taking your actual puff. This heats up the internal atomizer in the cartridge and produces better vapor. That tip is important in these e-cigarettes because they have a slightly tight draw and a less than sensitive response to puffing. It’s not laborious or anything crazy, but it takes perhaps a little more puffing that a regular smoker might be used to, for example. This one would be more in the cigar territory. Giving the puffing action a little TLC does pay off with a nice thick vapor. Throat hit isn’t excessive in these ecigs most likely as a result of the low nicotine content. I also found the flavor to be a little muted. That’s not a bad thing in my book when it comes to tobacco flavored electronic cigarettes as I’m simply not a fan of most tobacco flavors these days. While this might not be the highest performing traditional e-cigarette I’ve run across, it is one of the easiest thanks to the included charging case. You can grab one of your own at Ecigair’s website. 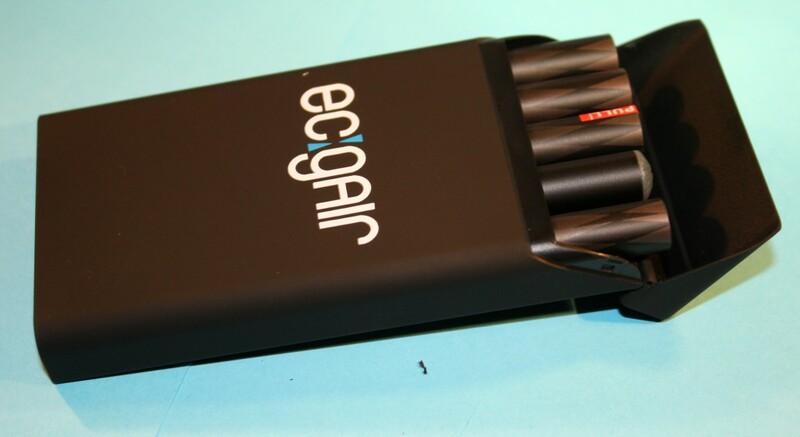 Ecigair’s traditional starter kit available in all black with 0 or 11mg of nicotine is fairly standard fare as far as traditional e-cigarettes go. It uses a somewhat obscure battery connection, but it features a very nice portable charging case with generous storage. This is a great kit for fans of traditional e-cigarettes (or beginners) who are out and about for long stretches of time. 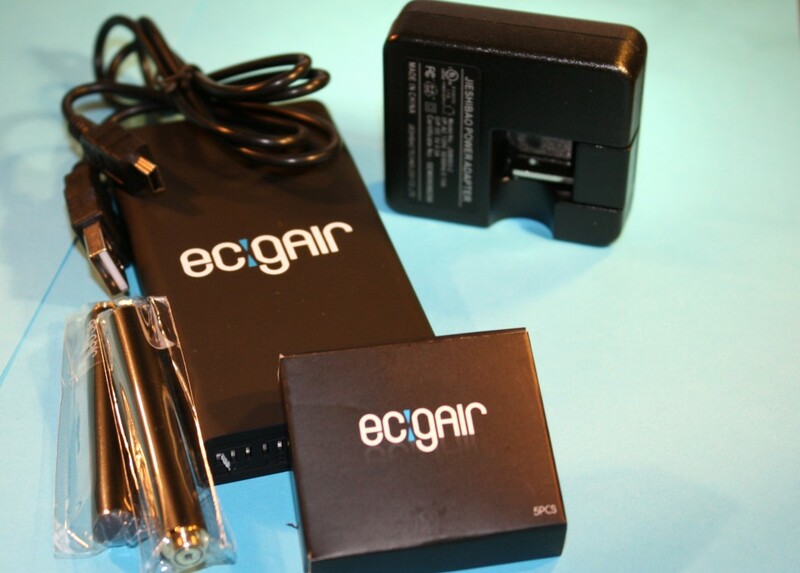 Disclosure: this product was provided by Ecigair for review purposes. This article may contain affiliate links.